Each year, I plan to make a gift from T for our immediate family, we also make one for ourselves, eventually I'm hoping to have a small tree full so I can bring that out when he's off in the big wide world (sob!) and completely embarrassed by them! 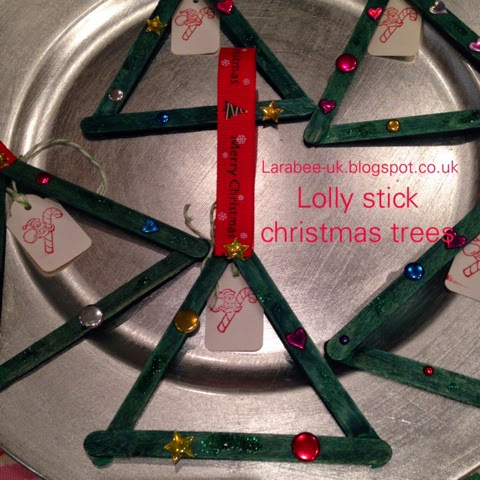 Last year we made these cute little lolly stick Christmas trees. I didn't buy any items specifically for this project, I just raided my own craft cupboard and pulled out things I thought we could use, some stickers, some gems, glitter glue, ribbon and some tiny tags which I stamped with a Christmas image and added the year and 'Handmade by Thomas' on them. I started by gluing the lolly sticks together to form a triangle, I used a hot glue gun for this but any strong glue will suffice. Then I handed over to T to decorate the trees using the goodies in front of him, he loved squeezing on the glitter glue and sticking on the stickers. Once T had finished, I applied some 'Merry Christmas' ribbon and the gift tag. These look fun to make. Would you like to add it to our #christmascraft linky? http://trainingmummy.com/christmas-linky/ Wll have to go buy some ice lollies to get sticks (there is no other way to get stick is there? no? ice lollies it is then).